Now streaming on Netflix is a fascinating docuseries about the role of comedy in some of the world’s most dangerous locations. The show is Larry Charles’ Dangerous World of Comedy from the mind of writer, director and producer Larry Charles. In case you are unfamiliar with Charles, he is the director of such films as the iconic Borat, Brüno and The Dictator. His TV credits include such seminal shows as the legendary Seinfeld and Curb Your Enthusiasm. 411Mania recently had the chance to sit down and speak with Larry Charles about his new TV series about finding comedy in the most unlikely places. For the show, Charles traveled to such tumultuous regions as Iraq, Nigeria, Somalia and Saudi Arabia in order to discover the comedy cultures that are actually thriving there. His subjects include the comedians who are keeping their brand of comedy alive despite the difficulties. We also spoke a bit about his time on Seinfeld and working with actor-comedian Sacha Baron Cohen. Jeffrey Harris: While I wouldn’t say the docuseries has returned to prominence, it definitely appears that with Netflix, the docuseries has become a major player in the industry. Would you agree? Larry Charles: Yes. I think that people have seen a lot of stories. They’ve seen a lot of fiction, a lot of narrative. Very little of it is unpredictable anymore. They’re hip to it. They know how most stories unfold. They know how most twists and turns take place. So it’s very hard to keep the audience surprised and engaged that way. Whereas, nonfiction is so absurd and so real and so unpredictable and so urgent and spontaneous that, and the states are real, I think that people find that a more compelling form in a lot of ways. And you’re right. Netflix has come up with a format for that that really works, from Making of a Murderer to The Innocent Man. Those sort of shows on Netflix are fantastic. Jeffrey Harris: I thought the subject matter here was interesting because it reminded me of a story Milos Forman told in a Charlie Chaplin documentary called The Life and Art of Charlie Chaplin. In that film, he talked about how important it was for the people of Czechoslovakia during Nazi occupation to watch Charlie Chaplin in the film The Great Dictator in 1940. That comedy was very important to the people at the time when Adolf Hitler was still in power. And you did a movie, The Dictator, and now you’re doing a show about how people in these tumultuous regions how comedy and being able to laugh is very important. What do you think of that? Larry Charles: Thank you. It’s almost like The Dictator, but from the comedian’s point-of-view this time. Yeah, I think that it seemed like a very rich area that had not been mined at all. I think that in the same way that Milos Forman was talking about the need for people in Nazi Germany to see The Great Dictator, I think that we in this country during the two years of the Trump administration have become isolated — he wants to isolate us from the rest of the world. He wants to drop out of all the treaties, all the agreements. He wants to deride all the other countries, whether they are allies or he’s playing up to our enemies, or he’s insulting entire continents like Africa. I thought my travels really belie so much of what he says. The people in these countries — Muslims, Christians, atheists, whatever are really very much like people here. They want the same things. They’re not fanatics. They’re not extremists. They want safety. They want security. They’re just like us. I think that Trump gets a lot of play by dividing people. I thought this is one thing that I can do to combat that divisiveness by exposing America to this worldview that they will very much recognize as themselves. Jeffrey Harris: Considering the places you visited, just how dangerous was filming the Dangerous World of Comedy? Larry Charles: I don’t know how much you know about geopolitics. We’re in Mogadishu, which is considered possibly the most dangerous city in the most dangerous country of the world. The week that we left, 550 people were killed in one single bomb blast. There’s constant terrorism going on. There’s checkpoints going on. There’s machine guns and 17 different factions of troops and militia, so it is a very chaotic — it’s where Black Hawk Down took place. It’s a very chaotic, broken down place. It is all rubble. It is people hiding in the shadows. It’s sudden surprises. Every comedian who I spoke to in Mogadishu had been a victim of an assassination attempt, had been imprisoned, had been tortured, and I met one comedian who told me about his friends who we had done research on who was actually assassinated. So, that was a dangerous place. And we had to be lucky to sidestep the violence that is all around us. We never read about all the clashes that are going on in the world. The American press doesn’t even cover most of this. So, Nigeria is also in tremendous conflict. Liberia is recovering from a civil war. So again, there’s reminders of atrocities everywhere you look. We were in Iraq. We were in Iraq during the fall of Mosul. We were in a town called Kirkuk that had been destroyed by Isis. We went to an Isis prison and talked to Isis prisoners. I talk to an Al-Shabaab defector in Mogadishu, so I tried to — I didn’t want to call it the Dangerous World of Comedy without it really being dangerous ultimately. We did cover a lot of very dangerous places, places that we had to argue with the state department to get into. So, as scared as I was, I didn’t want to take the easy route. If I wanted to take the easy route, I wouldn’t even do the show. I would just do something safe here. I would do a pilot in Los Angeles. I wanted to do something that had that urgency, and I had to go to these places. I thought to myself, “These comedians are there.” These comedians are in Mogadishu. They’re doing their comedy there. I’m only going to be visiting for three days and then leaving. They’re gonna have to stay there. So I thought, I can give them three days to expose their story to the world. Jeffrey Harris: You do narrate the show, but you’re only on camera very sparingly. Was the thought to showcase your subjects more than yourself? Larry Charles: Yes. I mean I saw myself as the Werrner Herzog of comedy, and I kind of used him as a role model. He is narrating his documentaries. He is occasionally on camera inadvertently. I am occasionally on camera inadvertently just because everything is so spontaneous, and cameras are just whipping around. And sometimes I’m just there. And I thought, I’m not going to intend to be on camera, I’m not going to be an on-camera host presenting the show, but if I’m on camera occasionally that’s OK. And I thought again, that’s sort of the natural quality of this. I didn’t want to contrive anything. I want it to be as pure as possible. Jeffrey Harris: Is it possible you could go to North Korea and Cuba for this show in the future? Larry Charles: Yes. I think Cuba is very doable. It’s not far. It doesn’t cost a lot of money. You can get permission to go there under certain conditions. North Korea can be gotten to. Much tougher. We looked into it. We had a limited budget and a very limited, tight schedule. There are places like North Korea, it takes a long time just to get the permissions, to get the visas, and we could not go through that whole entire process in the time that we had to go there. There are lots of countries like that. We tried to go to Syria, and Syria was one of those places that the state department said, “No. That’s where we’re drawing the line. You can’t go there.” So, we had restrictions that we could not overcome this time, but we learned a lot. If we did this again, we’d try to get into some of those countries too. Jeffrey Harris: When you worked on the legendary TV series, Seinfeld, when you were working on it at the time, did everyone know how special it was and how much of a cultural impact it would have? Did you all know you were making history? Larry Charles: No, it was actually — and believe it or not — it was quite the opposite. When I went to work on the show, Larry David said to me, “Look. We’ll do 13 episodes. We’ll make some money, and then we’ll move on with our lives.” So, that was the key to the success. We didn’t give a s***. We didn’t care. We did exactly what we wanted. We had never written sitcoms before. We made it up as we went along. And those shows wound up being Seinfeld and being very distinctive because of our obliviousness or ignorance of the form. And no, we didn’t think it was a phenomenon at all. I don’t think I ever thought during the time I was there — but I never thought — it’s like you can’t predict The Beatles. There were lots of groups in England at that time that were sort of ascending. Why did The Beatles become The Beatles? Why does Seinfeld have this kind of mythical status that people are still discovering it today while so many sitcoms have fallen by the wayside? That’s kind of a mystery. I can analyze it with you. We can spend a lot a lot of time figuring that out. It’s truthful. That’s one of the things about it. It taps into a darkness that most comedies do not tap into. It’s very, very honest about it. It shows the dark side of human nature. It’s able to be super funny, which is a key to comedy. So much of what’s called comedy is not really funny. Seinfeld is still funny to this day. People will come up to me and tell me how much they laugh at something they’ve seen 100 times. So, it’s almost like the church experience. They want to go back and have that same experience again. They want to hear the same sermon. It’s a kind of a weird social phenomenon in some ways. Jeffrey Harris: Besides the docuseries, the other thing that’s become really big as of late is the revival of older TV shows. Has there been any interest in recent years to try and bring the band back together to try and revive Seinfeld? Larry Charles: First of all, I wouldn’t be interested in that, but I can also guarantee you 100% that Larry [David], Jerry [Seinfeld], Julia [Louis-Dreyfus], Michael [Richards] and Jason [Alexander] would all not be interested in doing that. What we did, which was our version of a reboot essentially, was the Curb Your Enthusiasm season with the Seinfeld cast. That was the nod to that sort of reboot fever, which is now even more fervent than it was then. So no, I wouldn’t think about doing a Borat sequel. I wouldn’t think about doing another Seinfeld. I don’t like to go back and revisit past work. I want to stay creatively vital and radical. I think the reboots are part of the complacency in the American culture, so I don’t really support that. Jeffrey Harris: With your collaborations with Sacha Baron Cohen, what would you say is special about working with an artist like that and tapping into his talents? Larry Charles: Well, he’s one of the most intense people that I’ve ever met. I feel like he — I actually feel like he should’ve won an Oscar for Borat. The reason is that up until the 1950s, acting was all about Laurence Olivier and the Shakespearean method and all those kind of cagey, contrived stuff. And then Marlon Brando comes along, and he kind of fractures that entire template, that entire paradigm. Kind of invents modern acting, which is natural and real and honest and human. I felt like that was the template for acting until Sacha comes along, and he takes that one step further. He comes out of the hotel room in the morning, and he is Borat. When I have arguments with him, I argue with him as Borat. He has to be Borat all day long, and people are standing two inches from and have to believe that he’s this guy from Kazakhstan. He had to keep that illusion up, that performance up, all day long with all kinds of people. And we did long days on that movie because he has unlimited energy. So to me, a performance like that, it transcends movies. You’re not dealing with other actors. You’re dealing with real people, but you’re playing a role. I thought there’s nothing comparable to that in the history of movies. I thought he deserved some kind of accolade for that. I mean he got a lot of accolades for it, but I thought he really broke the mold on acting for that. And you watch a lot of fictional performances now, in light of what Sacha did, they feel like they’re contrived. They feel like they are planned out. Even Marlon Brando’s best performances feel like a performance, where Borat just is. And that is another level of acting that is just unprecedented. Thank you to Larry Charles for taking the time out of his busy schedule to speak with us. 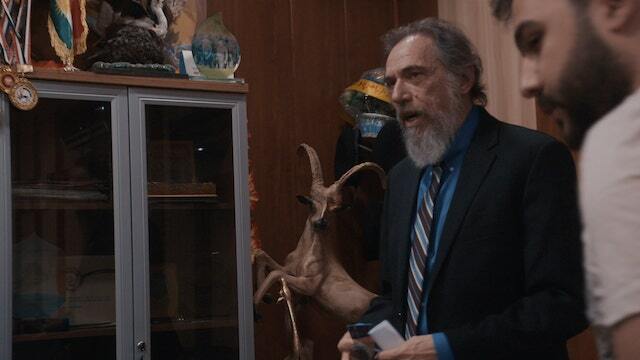 Larry Charles’ Dangerous World of Comedy is streaming now on Netflix.